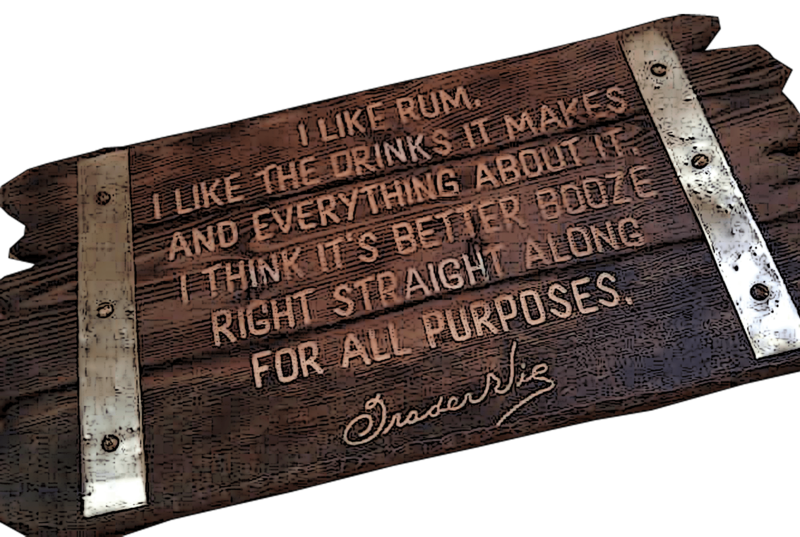 Well, there IS still some of those rums left…maybe a bottle or three? and these are kept by a few rum collectors..but i actually once did have a smaller bottle of one of the dagger rums. And yep i won`t forget that rum. Or the other vintage rums i`ve luckily been able to taste in various places. Many of these rums had a flavor profile that of old jamaican pot still plus so much more…and it seems to me that more and more rum companies are trying to re-create that flavor profile again – a good example is Smith and Cross. But these – even though they are very good to my taste – haven`t been able to duplicate the flavor those vintage rums had. We the rum drinkers who are or have not been in a position to collect some of those elusive vintage rums must make do with substitutions. 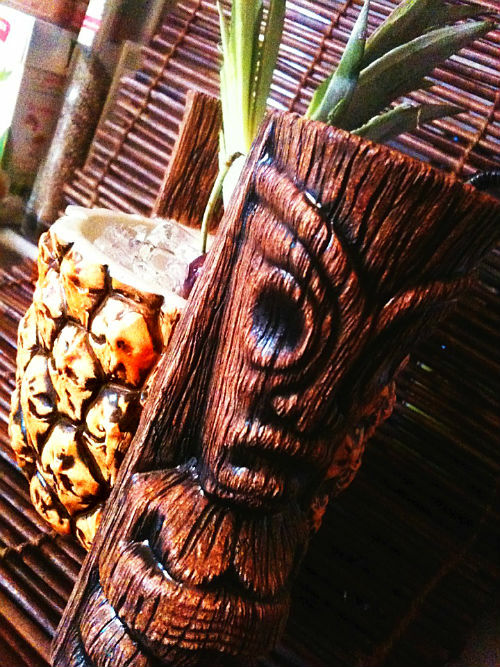 I`m going to make an example here with a vintage tiki drink called the Black Magic. 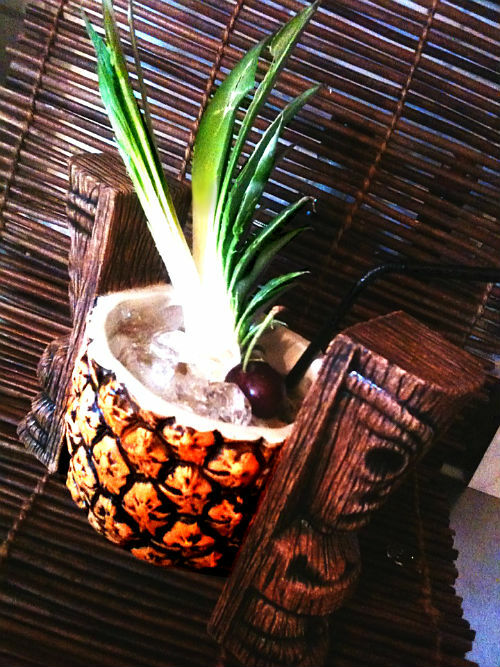 Dark rums and coffee is what gave this drink it´s name and it was made by Mariano Licudine while he was still working for Don the Beachcomber in the Don the Beachcomber restaurant in Chicago. 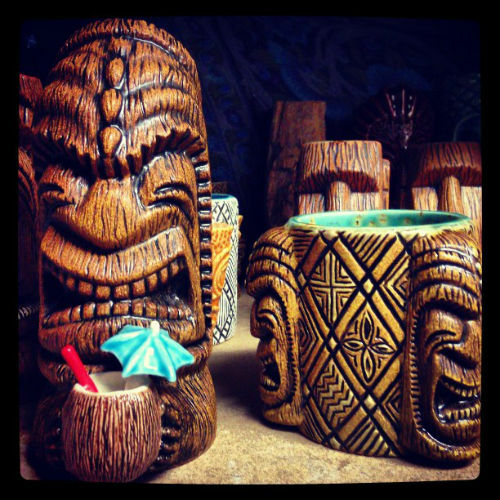 He later moved on to Fort Lauderdale to work at the Mai Kai. I have read that he had 48 drinks on his cocktail menu that called for 43 different kinds of rum…so he knew his rums and how to blend different rums to create new flavor profiles for his cocktails – much like Don the Beachcomber. 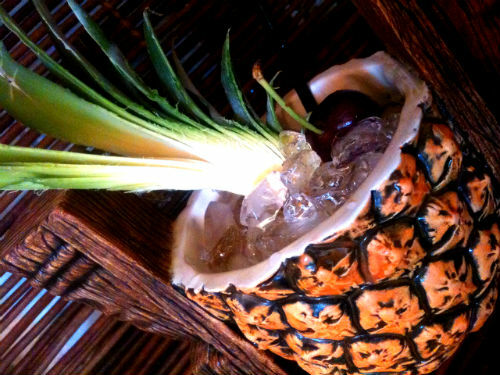 So when he went to work at the Mai Kai he brought with him many of the recipes of Don Beach drinks and made his own twist on them. What made the Black Magic so distinctive was not just the blend of dark rums and coffee which is delicious – but it was also the rums used and in this drink one of the Jamaican dagger rums played an important part. 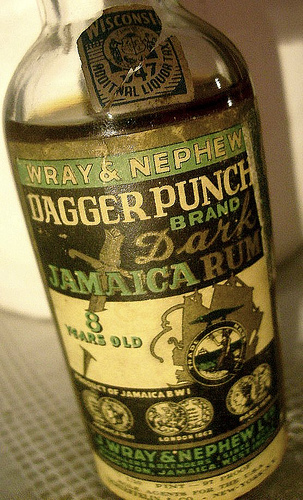 Dagger was a Jamaican dark rum brand which is now defunct. The one i tried had a dark mahogany color and dark tones of burnt molasses and dried fruits, and it was spicy and woody, balanced and complex with a vintage feel. There are different dagger rums with different agings and here´s what the Bum wrote about one of Mariano´s old dagger rums he tried at the Mai Kai´s back bar, stucked away on a shelf as it was. So what to do? how do we sub rums like that? 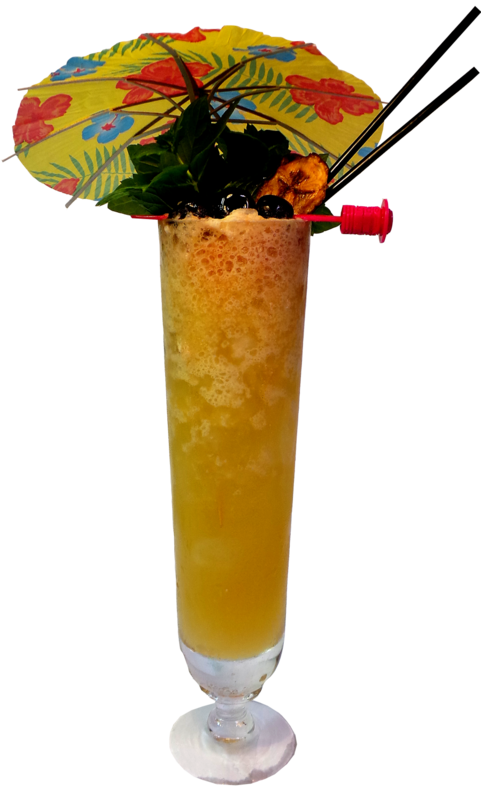 Reading more on the Atomic Grog`s website thought me that the same company that made the dagger rums now makes a rum that is hard to find – but not impossible – the Kohala Bay. Now i have no way of finding Kohala Bay so then what to do? i kept reading and found out that they suggested an equal mix of Smith and Cross and El Dorado 12 year old demerara rum. And finally – i can do that. What i can say is that these rums made a nice drink, tasty and strong but if it comes anywhere close to how the original Black Magic tasted when made with the jamaican dagger rum – it surely ain`t. And close to how it tastes with the Kohala Bay rum? i cannot tell…all i can say that it´s a tasty drink and that the Smith and Cross/El Dorado 12 yo combo is a good one. 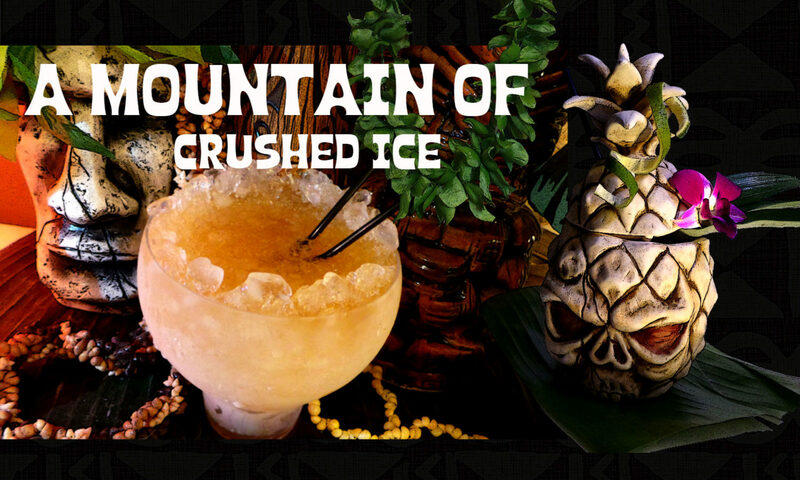 Try it for yourselves..this recipe is the Tribute to the Dark Magic as found on the Atomic Grog. The owner’s choice. A superbly smooth but forthright blending of fine dark rums and tropical juices, subtly laced with coffee and truly refreshing. Blend with up to 1 1/2 cups of crushed ice in a top-down mixer for around 5 seconds, or until frothy. Pour into a large snifter glass with more crushed ice to fill. Garnish with a lemon peel. Something about the coffee…try to get real Hawaiian Kona coffee if you can but if you can`t try to get either Louisiana Community coffee dark roast or Jamaican Blue Mountain. I don`t think any other coffee will do. You need a full flavored and strong coffee like these. 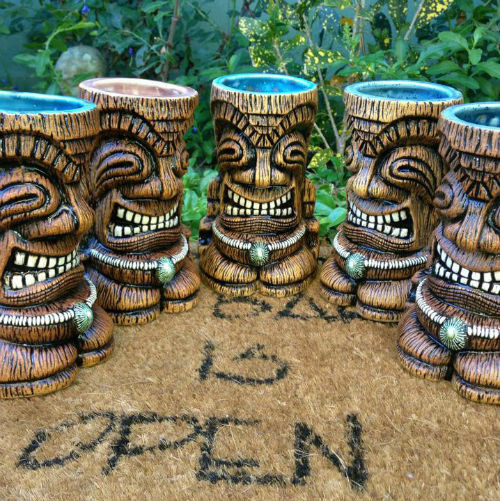 If you go to Maui make sure to stop by the shop, you will find tiki mugs by Scott, Rob and some other local artists, tiki farm, etc. 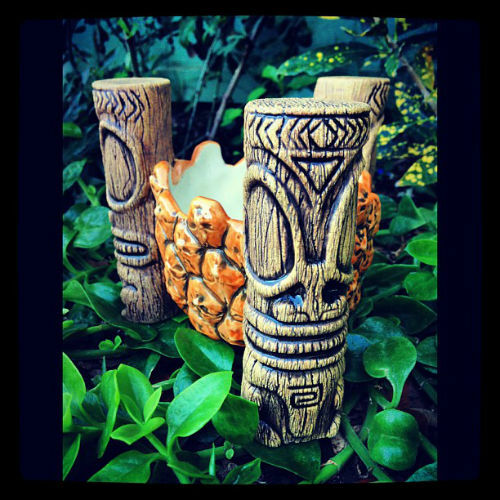 Also Gecko on Oahu will be releasing Scott´s new Ka’oha design mug in a much more affordable run than the others that have sold..most likely in July on his Southseaarts.com website.